We are now in Agra, India. Agra is famous for the Taj Mahal. This is as far as our bus can go. From here, it is either walk or ride in one of those carts. But wait a minute. Humans cannot take much near the Taj Mahal. Ducks are not allowed in the Taj Mahal area. Oh no!! 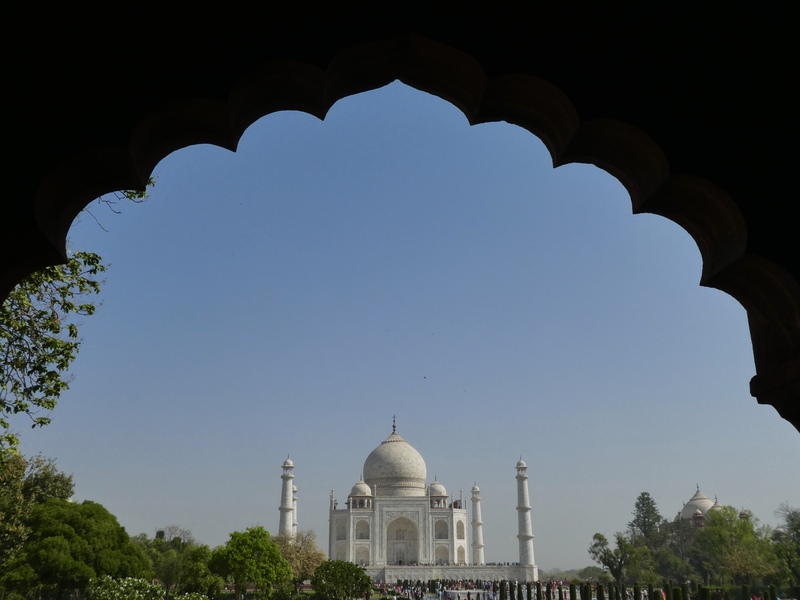 But it is OK. Our moms said we will be able to see the Taj Mahal from other areas, including the restaurant of our hotel, Clarks Shiraz Hotel. Zeb and Soapy Smith Duck stayed on the bus. The humans rode in a cart. Here is the ticket purchasing area. Jesse, our guide, purchased the tickets. 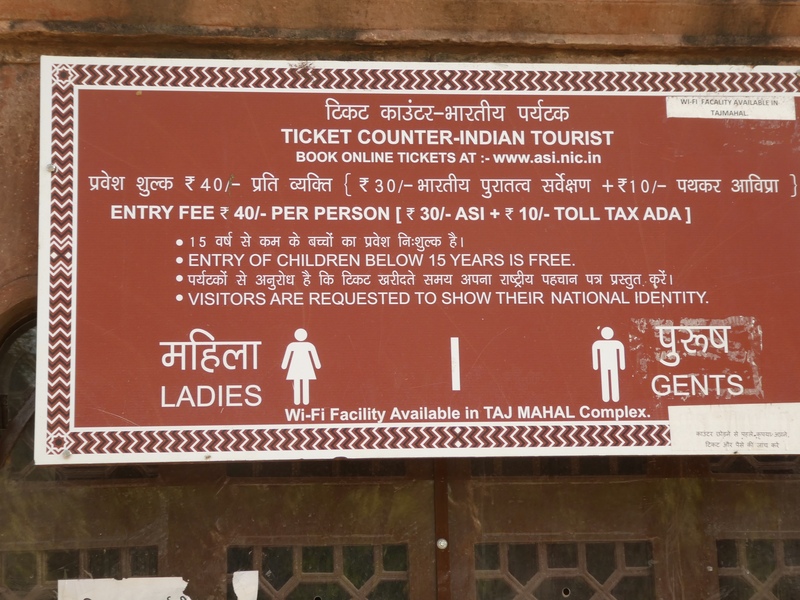 Tickets are different prices for foreigners than they are for Indians. That is fine. The people that live here should be able to enjoy this beautiful building. Humans walked through this building, and this is what they saw. The Taj Mahal is symmetrical. 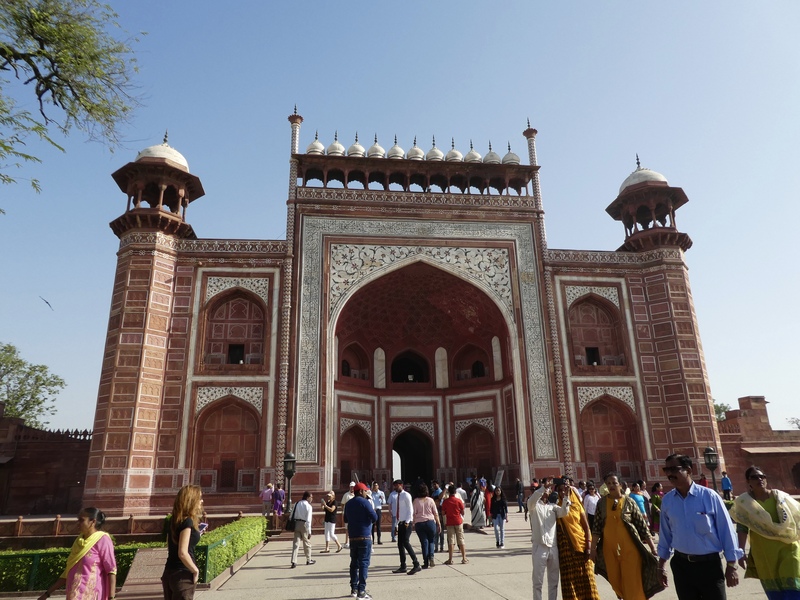 A mosque was constructed on one side of the Taj Mahal, so another mosque was built on the other side. Must be symmetrical. Jesse, our guide, had humans sit on a platform and explained a little about the Taj Mahal. This building was commissioned by Shah Jahan to enshrine the mortal remains of his Queen Mumtaz Mahal. This was built from love. Isn’t that romantic. We love that love was so strong. She died during childbirth. They were married 17 years. There were other wives, but Mumtaz was the favorite. We like this photo. This was taken from the platform the humans sat on while Jesse explained things. Walking closer, we can see the craftsmanship of inlaid jasper in the white marble. This marble is from India. In 1631 Mumtaz died and the construction of the Taj Mahal began. The beautiful building built of love, was completed in 1653. 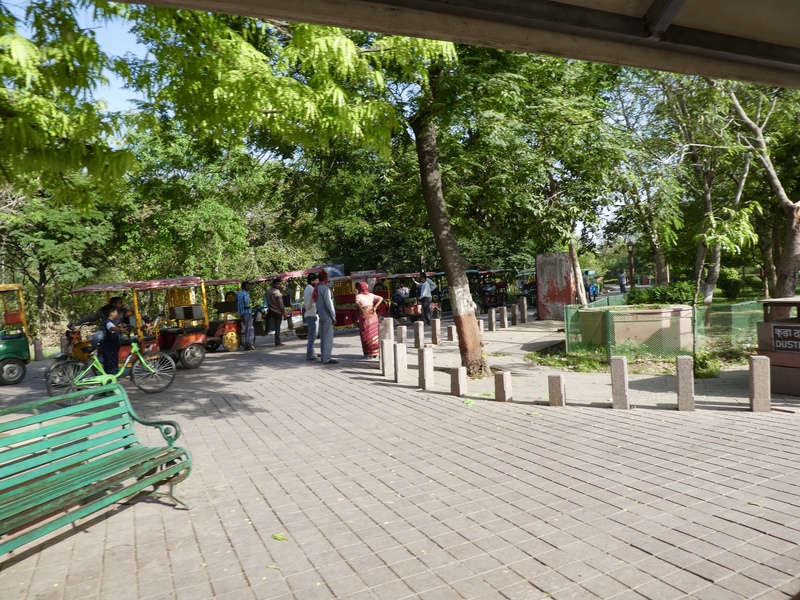 There is a bench in front of the Taj Mahal called the Princess Di (Diana) bench. Soapy’s mom is by the bench. Our photographer told her how to pose. She was not swimming in the reflecting pools. Inside, visitors are only allowed in the center area of the main floor. The tombs here are empty. The real tombs are in the lower level. 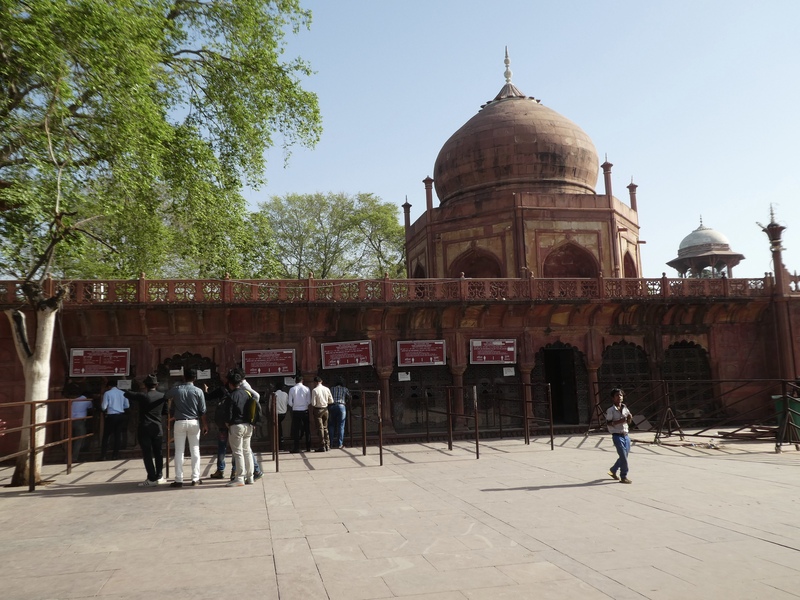 Pictures of the tombs are not allowed and this structure surrounds the tombs. Looking through, we could see two tombs. 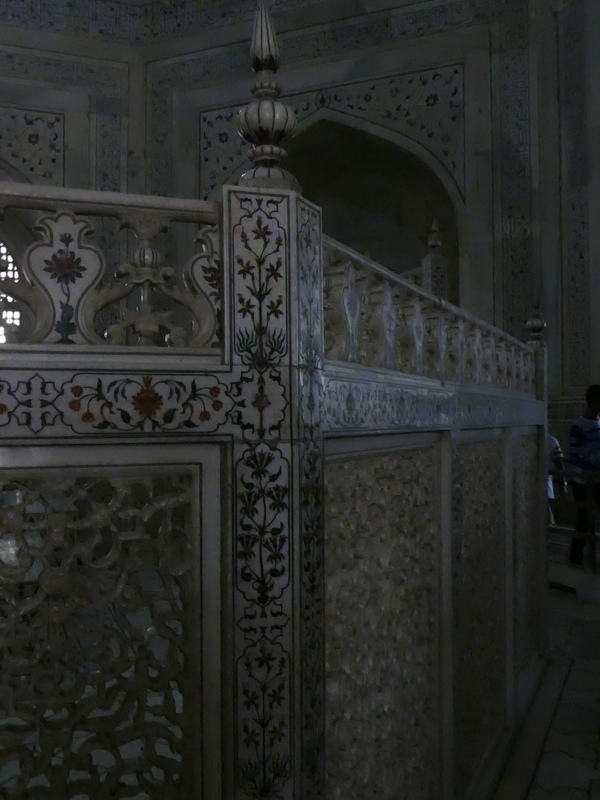 Shah Jahan built this for his Queen Mumtaz. Her tomb is in the center. He wanted another smaller building across the river for his memorial. His was to be of black marble and a bridge was to be built connecting the two memorials. However, that did not happen. He was disposed by his son in 1659 and upon his death, his body was placed next to Mumtaz. While viewing the Taj Mahal, there are many photographers eager to take your photos. Our moms hired a photographer and had fun with him. Here he is with Soapy’s mom. We won’t tell you how many photos were purchased, but our moms had a great time. This a beautiful building and a wonderful memorial to love. 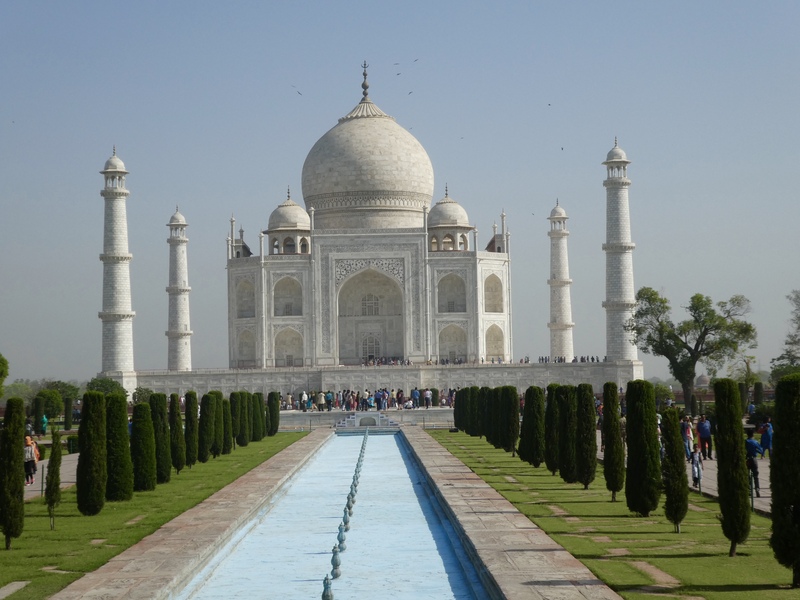 We hope you visit Agra, India to see the Taj Mahal. 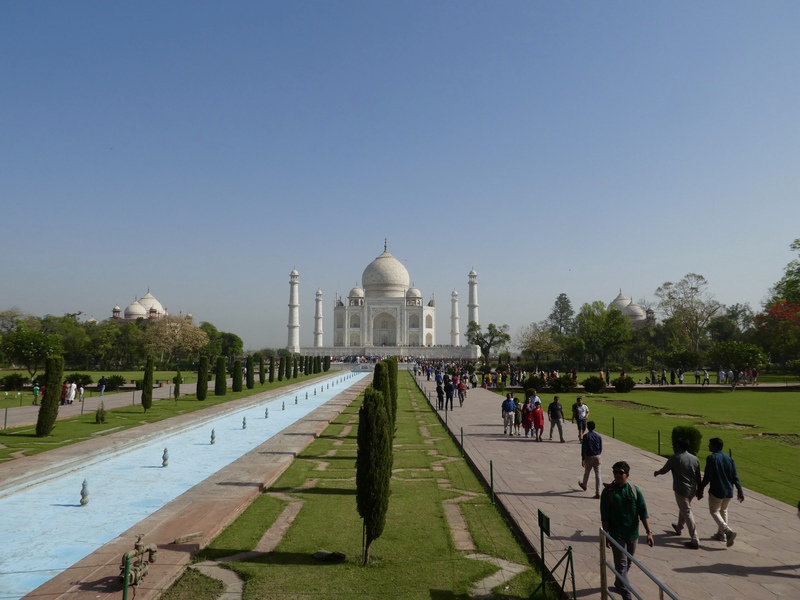 This entry was posted in Agra, India, Uncategorized and tagged Agra, Colorado Traveling Ducks, India, inlaid jasper, Marble, Queen Mumtaz Mahal, Shah Jahan, Taj Mahal. Bookmark the permalink. Lovely photos of a beautiful place. It is a beautiful building. Such a tribute to love. Thanks for reading and commenting. Thanks. Beautiful building. Peaceful setting. Thanks for reading and commenting. Non residents pay more but I didn’t mind at all. Loved the Taj. loved it. We also were fine with paying more. We wish everyone would come to see this beautiful building. The humans really enjoyed it and we ducks enjoyed it from other vantage points. Thanks for reading and commenting. We enjpyed your post about Delhi also. What a classic view and nice photos! Looks like quite worth the travels/visit. It’s on my bucket list! It is a beauiful setting and a stunning building. I really hope you visit the Taj Mahal. And, also Fort Agra across the river. You won’t be disappointed.